Agency Index for State of California - This index lists state agencies, departments, divisions, boards, commissions, and other state entities. Air Resources Board - Sets and enforces emission standards for motor vehicles, fuels, and consumer products. Sets health-based air quality standards. Conducts research. Monitors air quality. Identifies and sets control measures for toxic air contaminants. Provides compliance assistance for businesses. Produces education and outreach programs and materials. Oversees and assists local air quality districts which regulate most non-vehicular sources of air pollution. Air Toxics Program - Establishes the process for the identification and control of toxic air contaminants and includes provisions to make the public aware of significant toxic exposures and for reducing risk. Anti-Terrorism Information Center - Formed in the wake of the September 11 attack on the World Trade Center and the Pentagon to provide law enforcement with statewide intelligence support to combat terrorism. Assembly - Official California State Assembly website. Attorney General - Represents the people of California in civil and criminal matters before trial, appellate and the supreme courts of California and the United States. Auditor - As the state's independent external auditor, the California State Auditor provides independent, nonpartisan, accurate, and timely assessments of California government's financial and operational activities in compliance with generally accepted government auditing standards. Board of Equalization (BOE) - Collects taxes and fees that provide more than 34 percent of the annual revenue for state government as well as essential funding for local government. Fees administered by the Board produce funding for programs supporting education, health care, public safety, transportation, social services, housing, and natural resource management programs. Bureau of Automotive Repair - Registers and and regulates approximately 41,000 California automotive repair facilities, and licenses smog check, lamp and brake inspection stations. Business, Transportation & Housing Agency - Oversees 16 programs that plan, build, and maintain California's transportation systems, that ensure fair markets for the real estate industry, and that assist state and community efforts to expand affordable. Cal Fire - Provides varied emergency services in 36 of California's 58 counties via contracts with local governments. The Department's firefighters, fire engines, and aircraft respond to an average of more than 5,600 wildland fires each year. Those fires burn more than 172,000 acres annually Also see California Statewide Fire Map. California - Official State of California home page providing government and other resources, including sections covering: Business, Consumers and Families, Education and Training, Environment and Natural Resources, Government, Health and Safety, History and Culture of California, Labor and Employment, Travel and Transportation. California Budget - Budget details. California Department of Water Resources (DWR) - Responsible for managing and protecting California's water. DWR works with other agencies to benefit the state's people, and to protect, restore and enhance the natural and human environments. California Directory, The - A service provided by the California Department of Technology. The Online Directory provides access to government information and services for state employees, local government and the general public. The directory services include state employee information, state agency information, and a State Government Organization Chart, as well as a keyword search. 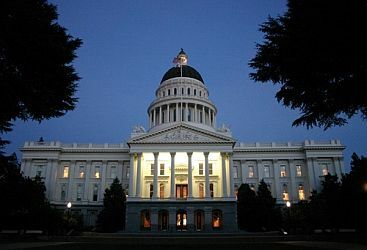 California Legislative Information - The California Constitution, statutes, and the California Codes are published here. This website lists all reports required by statute to be prepared and filed by state and local agencies with the Legislature or Governor. Search bills here. Search codes here. California Military Department - Comprised of the California Army National Guard, California Air National Guard, California State Military Reserve and California Youth and Community Programs. California Coastal Commission - Lead agency responsible for carrying out California's coastal management program. Regulates development in the coastal zone consistent with the California Coastal Act. California Emergency Management Agency - Coordinates state agency response to major disasters in support of local government. California Energy Commission - The state's primary energy policy and planning agency. California Environmental Protection Agency (Cal/EPA) - Mandate to improve environmental quality for the protection of public health and for the welfare of California's citizens and its natural resources. California Environmental Resources Evaluation System (CERES) - Information system developed by the California Resources Agency to facilitate access to electronic data describing California's environments. California Government Organizations - Directory of organizations. California Legislative Information - Official site for California legislative information. The site is maintained by the Legislative Counsel of California. California Local Government Finance Almanac - Data, statistics, analyses, and articles on California city and county finance. California National Guard - California's military force. California Office of Emergency Services (Cal OES) - Responsible for overseeing and coordinating emergency preparedness, response, recovery and homeland security activities within the state of California. California Public Utilities Commission (CPUC) - Regulates California's privately owned electric, natural gas, telecommunications, water, railroad, rail transit, and passenger transportation companies. California State Agency Index - This index lists state agencies, departments, divisions, boards, commissions, and other state entities. California State and Local Government on the Net - Piper Resources guide to government sponsored Internet sites. California State Archives - A repository for the state's permanent governmental records as well as other materials documenting California history. California State Bar - Created by the state legislature in 1927, the State Bar is a public corporation within the judicial branch of government, serving as an arm of the California Supreme Court. All State Bar members are officers of the court. Membership in the State Bar of California affords attorneys the right and privilege of practicing law in this state. The bar's integrated network of functions and services - many of them mandated by law - protects the public and assists attorneys in meeting their professional obligations. Contact the State Bar's Complaint Hotline at 800-843-9053 . California State Board of Equalization - In addition to tax administration of key state revenue programs, the Board plays a critical role with regard to California property taxes. Further, it acts as the appellate body for franchise and income tax appeals. California State Lands Commission (CSLC) - Established in 1938 with authority detailed in Division 6 of the California Public Resources Code. Assisted by a staff of more than 200 specialists in mineral resources, land management, boundary determination, petroleum engineering and the natural sciences the Commision deals with energy resources, environmental management, granted lands, hazard management, oil spill prevention, and more. See Regulations page. Capitol WebWorks - An Internet consulting firm specializing in political, governmental, and public affairs communications. Capitol WebWorks provides website development and management, online grassroots action tools, legislation tracking, and electronic lobbying disclosure, and more. Conservation & Liquidation Office (CLO-California) - Comprised of insurance professionals, e.g., Claims Officer, Reinsurance Officer, Chief Financial Officer, or Information Technology Officer who oversee departments that operate and liquidate insurance companies. If you are looking for general information about the conservation or liquidation process, consult FAQ. If you are looking for information about a specific insurance company that has been placed under conservation or liquidation by the State of California, visit Insolvent Companies page. Constitution - Links to the California State Constitution. Contractors State License Board (CSLB) - Licenses, enforcement procedures, complaints and citations, bonds, license classifications, blueprint for becoming a California Licensed Contractor, license Q&A, baseline cost for type B construction, contractor license status check, and more. Protects consumers by regulating the construction industry through policies that promote the health, safety and general welfare of the public in matters relating to construction. Controller - The California State Controller provides fiscal control over receipts and disbursements of public funds; reports periodically on the financial operations and condition of state and local government; makes certain that money due the state is collected through fair and effective tax administration; provides fiscal guidance to local governments; serves as a member of numerous policy-making State boards and commissions; administers the Unclaimed Property and Property Tax Postponement Programs. Department of Aging - Administers home and community-based services throughout California, working primarily with 33 Area Agencies on Aging serving seniors throughout the state. Department of Alcoholic Beverage Control (ABC) - ABC has the exclusive power, in accordance with laws enacted, to license and regulate the manufacture, importation and sale of alcoholic beverages in this State. It also has the power for good cause to deny, suspend or revoke any specific alcoholic beverage license. Department of Boating and Waterways - Programs include funding and designing the construction and improvement of boating facilities, beach erosion control, aquatic weed control, boating safety education, Clean Vessel Act grants and supporting and training local boating law enforcement officers. Department of Consumer Affairs - Licenses more than 2.5 million Californians in more than 200 different professions ranging from doctors to accountants to contractors. Also see DCA's Complaint Resolution Program. Department of Consumer Affairs License Lookup - Use this page to look up a company or individual who has a California license issued by the Department of Consumer Affairs. Information provided includes address, license number, and disciplinary actions taken (if any) for licenses of various types in the following major categories: Accountancy, Acupuncture, Architects, Athletic Commission, Automotive, Barbering and Cosmetology, Behavioral Sciences, Cemetery and Funeral, Chiropractic, Contractors, Court Reporters, Dental, Electronic and Appliance Repair, Engineers and Land Surveyors, Geology, Hearing Aid Dispensers, Home Furnishings, Landscape Architects, Medical Board, Midwives, Occupational Therapy, Optometry, Osteopathic Physicians, Pharmacy, Physical Therapy, Physician Assistants, Podiatry, Private Postsecondary and Vocational Schools, Psychiatric Technicians, Psychology, Registered Dispensing Opticians, Registered Nursing, Respiratory Care, Security and Investigative, Speech-Language Pathology and Audiology, Structural Pest, Veterinary Medicine, Veterinary Technician, Vocational Nurses. Department of Corporations - Protects and informs California's population in the areas of Health Maintenance Organizations, the offer and sale of securities, franchises and off-exchange commodities, and transactions involving certain fiduciaries and lenders regulated by the Department. Department of Corrections and Rehabilitation - CDCR budget, facilities, inmates and parolees. Responsible for overseeing one of the largest prison populations in the United States, and has more than 36,000 custody staff that support the 24-hour, seven day-a-week operations. Department of Education - Teaching, learning and technology; state and school finance and statistical data; health and nurtition programs; special alternative and continuing education. Department of Finance - Establishes appropriate fiscal policies to carry out the Governor's administrative program. Prepares, enacts, and administers the California's Annual Financial Plan. Maintains the California State Accounting and Reporting System (CALSTARS). Monitors/audits expenditures by State departments. Develops economic forecasts and revenue estimates. Also see Historical Documents. The budget for the current Budget Year (July 1 - June 30) is also available on the California Budget Web Site. For budget-related information and resources for state agencies and budget analysts, see the Budgeting section of this site. Department of Financial Institutions (DFI) - Responsible for administering state laws regulating state-licensed financial institutions: banks, credit unions, industrial banks, savings associations, trust companies, offices of foreign banks, issuers of travelers checks and payment instruments (money orders), and transmitters of money abroad. Department of Fish and Game - Manages California's fish, wildlife, and plant resources, and the habitats upon which they depend. Department of Food and Agriculture - Inspectors examine meat, poultry, vegetables, fruits, dairy and other foods, to ensure safety and quality; pest eradication teams work to prevent infestations of unwanted pests and disease; international trade representatives help growers create new markets for their products overseas; and biological control researchers work to discover new, environmentally friendly alternatives to pesticides. Department of Health Care Services (DHCS) - DHCS works with health care professionals, county governments and health plans to provide a health care safety net for California's low-income and persons with disabilities. Department of Housing and Community Development - Provides leadership, policies and programs to expand safe and affordable housing for Californians. Department of Industrial Relations - Established to improve working conditions for California wage earners. Department of Insurance (CDI) - CDI assists consumers, aids in the licensing of insurance agents or brokers, and serves as a source of information on laws that regulate the California insurance industry. Department of Justice Firearms Division - Conducts eligibility checks for firearms purchases, issues various special weapons permits, conducts inspections of firearms dealers to ensure compliance with California firearms laws and policies, regulates gun shows, regulates assault weapon registration, certifies the testing of handguns and firearm safety devices, and performs other tasks regarding firearm-related matters. Department of Justice: Office of the Attorney General - Information on consumer issues, crime and violence prevention, public safety topics, as well as publications, reports, and press releases. Department of Motor Vehicles (DMV) - Registers vehicles and licenses drivers in California. Also see DMV Online Services. Department of Real Estate - The primary objective of the Department is the protection of the public interest in regard to the offering of subdivided lands, and the handling of real estate transactions by licensees. Department of Social Services - Provides aid, services and protection to needy children and adults. Department of Toxic Substances - Protects public health and the environment from harmful exposure to hazardous substances. Department of Transportation (Caltrans) - Responsible for the design, construction, maintenance, and operation of the California State Highway System and that portion of the Interstate Highway System within the state's boundaries. Alone and in partnership with Amtrak, Caltrans is also involved in intercity passenger rail service in California. Also see Caltrans Quickmap which presents several types of real-time traffic information layered on a Google Map. Division of Workers' Compensation (DWC) - DWC monitors the administration of workers' compensation claims, and provides administrative and judicial services to assist in resolving disputes that arise in connection with claims for workers' compensation benefits. Employment Development Department (EDD) - Provides services under the Job Service, Unemployment Insurance and Disability Insurance programs; handles the audit and collection of employment taxes (Unemployment Insurance, Disability Insurance, Employment Training and Personal Income Tax); maintains employment records for more than 15 million California workers. Franchise Tax Board - The department that collects state personal income taxes and bank and corporation taxes for the State of California. Governor of California - Official home page of California's governor. Insurance Code - Links to California Insurance Code sections. Insurance Commissioner - Regulates, investigates and audits insurance business. Legislative Analyst's Office (LAO) - Reviews and analyzes the operations and finances of state government. Also see Recent Publications. Legislative Counsel - Assists the Legislature, the Governor, and other state officers by providing legal services relating to the legislative process. Legislative Counsel: Agency Reports - Provides information about reports by various state and local agencies that are required or requested to be submitted to the Legislature, the Governor, or both. Information about the reports is processed by the Legislative Counsel and is updated on a continual basis. Little Hoover Commission - Created in 1962, the Little Hoover Commission (Milton Marks "Little Hoover" Commission on California State Government Organization and Economy) is a bipartisan, independent body whose function is to promote efficiency, effectiveness and economy in state programs. Medical Board - State agency that licenses medical doctors, investigates complaints, disciplines those who violate the law, conducts physician evaluations, and facilitates rehabilitation where appropriate. The Board performs similar functions for affiliated healing arts professions including registered dispensing opticians, spectacle lens dispensers, contact lens dispensers, licensed midwives, and research psychoanalysts. Office of Administrative Law (OAL) - Enforces the laws allowing California state agencies to adopt rules and regulations. Office of Environmental Health Hazard Assessment (OEHHA) - Mission is to protect and enhance public health and the environment by scientific evaluation of risks posed by hazardous substances. Office of Oil Spill Prevention and Response (OSPR) - California State agency with both major pollution response authority and public trustee authority for wildlife and habitat. Office of Real Estate Appraisers (OREA) - Charged with developing and implementing a real estate appraiser licensing and certification program that complied with the federal mandate. OREA's Licensing Division sets the minimum requirements for education and experience, according to criteria set by the federal government and California law, to ensure that only qualified persons are licensed to conduct appraisals in federally related real estate transactions. OREA is also responsible for the accreditation of educational courses and providers for real estate appraisers in California. Operations Agency - Mission is to improve management and accountability of government programs, increase efficiency, and promote better and more coordinated operational decisions. Parks and Recreation - Manages more than 270 park units, which contain the finest and most diverse collection of natural, cultural, and recreational resources to be found within California. Public Utilities Commission (PUC) - Regulates privately owned electric, telecommunications, natural gas, water and transportation companies, in addition to household goods movers and rail safety. Registry of Charitable Trusts - This web site offers information to assist you in evaluating solicitations and choosing wisely when responding to charities and commercial fundraisers who must register with the California Attorney General's Registry of Charitable Trusts and report financial activities annually. By searching the charities database, you can see if a charity is registered and reporting its activities as required by law. Research Guide: Compiling a California Legislative History - Provided by Hastings Law Library. Resources Agency - Mission: "To restore, protect and manage the state's natural, historical and cultural resources for current and future generations using creative approaches and solutions based on science, collaboration and respect for all the communities and interests involved." Secretary of State - The state's chief elections officer is also empowered to commission notaries public, to charter corporations, to oversee the State Archives, and to file a host of documents ranging from Uniform Commercial Code financing statements and tax lien information to certificates of limited partnerships and campaign and lobbyist disclosure information. Secretary of State Board of Equalization - Tax programs administered by the Board are concentrated in four general areas: sales and use taxes, property taxes, special taxes and the tax appellate program. Secretary of State Notary Public - The Notary Public Section is responsible for certifying to the authenticity of notary public's and public officials' signatures. Responsible for appointing and commissioning notaries public. Senate - Official California State Senate website. Also see Bill Information. Senate Office of Research (SOR) - Develops public policy initiatives for the California Senate. Conducts strategic policy planning and evaluates policy initiatives from sources inside and outside government. Assists members, committees and commissions of the California Senate. Small Business Certification - California state contracting information. State Library - The main research library for state government, providing reference and information services to all state government and specialized objective and nonpartisan research services to the Legislature, Governor's office, and other state constitutional officers. State Personnel Board - Guides the civil service system. Strategic Growth Plan: Bond Acocuntability - Through bipartisan cooperative action, the Governor and Legislature have initiated the first phase of a comprehensive Strategic Growth Plan to address California's critical infrastructure needs over 20 years. California faces over $500 billion in infrastructure needs to meet the demands of a population expected to increase by 23 percent over the next two decades. In November 2006, the voters approved the first installment of that 20-year vision to rebuild California by authorizing a series of general obligation bonds totaling $42.7 billion. Treasurer's Office - The Treasurer is elected statewide every four years. In addition to being the State's lead asset manager, banker and financier, the Treasurer serves as chairperson or a member of numerous State authorities, boards and commissions. Also see CDIAC Publications page. Unclaimed Property Search - This search page will allow you to locate unclaimed property that already has been sent to the State for safekeeping, as well as property that is about to be sent to the State by a business as required by law. California state law requires businesses to send to the State any property that has remained in their possession without any activity on the part of the owner, generally for three years or more. This webpage last updated on Wednesday, September 6, 2017 9:49 AM.